Merry Christmas, you jolly old elf! Jane here. As you know, I’m just a simple Manhattanite with simple tastes. I don’t ask for multiple-malt scotches: single malts will do just fine. I prefer neighbors who don’t need social services called on them, subway trains that run every 3 minutes, and rats that know the difference between garbage waiting at the curb for pickup and my kitchen. Most of the time, everything is just the way I like it. But this year, there are a few extra special items on my list, Santa, and I hope you can reach into your big bag and send me…. every dish? Maybe you could make sure they use the same supplier, who will give them boxes of “Instant Thai-Ice-Tea flavored powder”, “Sweet-n-sour (mostly sweet) noodle juice”, and “extra-thick and tough carrots”. I remember the days when Thai restaurants brewed their own tea and you could tell them apart by what their Pad Thai tasted like. Thank goodness those days are gone! Even so, there is still a small amount of local variety in the Thai restaurants near me. This year, Santa, please make sure that I can close my eyes and stick a random finger down on Yelp and it won’t make any difference at all. Talk about some Christmas magic! More people who stop short on the sidewalk. Santa, I’ve been getting around the city too quickly this year. I haven’t tripped over a loose chunk of concrete, slipped on some odd pudding-like substance left on the subway stairs, or been stuck for 2 blocks behind a pack of 35 tourists clumped tightly together, since I don’t know when! Can you change this for 2017? Can you please, please send me someone who is walking at a brisk pace on Broadway, but then stops suddenly in their tracks without bothering to cast a glance behind? That way, I’ll learn to be nimble on my toes, so as not to slam face-first into their backpack which is inexplicably filled with marble paving slabs. I’m sure whatever brings them to an abrupt halt will be worth it. Thanks! Suggested Replies from Google. You know me, Santa. I’m always at a loss for words. What I really need is for Google to give me several suggested replies that I can choose from when I use their new gmail “Inbox” app. You know, a feature that takes up valuable screen space to serve up phrases Google’s AI engine thinks I might want to use instead of going to all that trouble of writing something for myself. Let me give you an example. Let’s say I get an email from a former colleague who thinks I should go to a “free lecture” to learn how to “leverage my chakras” to “generate more revenue”. My inbox should immediately offer these options: “Sure, talk soon!” “Sounds like fun!” “Yeppers, that’s what I’ve been waiting for!” It sure will be a time saver if Google adds a feature like this, and not at all annoying. I bet you have an elf over in Mountain View that can get this done in no time! Be sure he forgets to add a setting that lets me suppress this feature. Why would I ever want to do that? More fashion-forward clothing. It’s gotten much too easy for me to find simple, comfortable clothing with useful pockets in my size. This year, top of my wish list is fashion-forward clothes that look like they were designed for a deranged teenager. I’ll be wanting lots of fringe, lace, cutouts, and tiny little caps instead of actual sleeves so my arms can wave about, free from the servitude of being covered by fabric. Make sure the waist of all my pants fall well below my navel and the hem line hits me right above my ankle. I’m a middle-aged woman working in finance, so I’ll need to show off my latest “ink”, front and back, to my colleagues. Last but not least – please make sure none of my pants have actual, working pockets. It always brightens my day when an artistically-cut micro-pocket decants my cell phone and keys onto the subway car floor as I rise to exit the train. Next Are you ready for 2017? It’s ready for you. 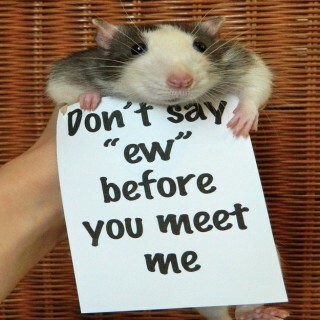 I like rats… I’m glad you mention them so often!! They are intelligent animals, and I had 2 pet rats once in my youth. They were named “Mickey the Rat” and “Jesus Sue”, and they were very affectionate.